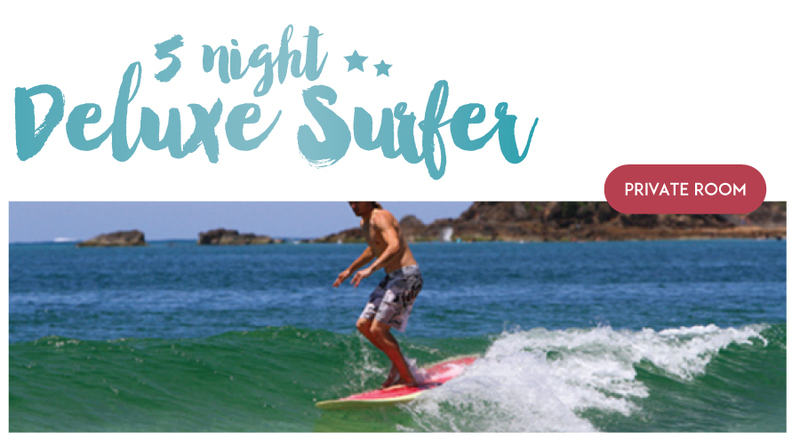 5 Night Private (1 Person) Surf and Stay " The Deluxe Surfer Package"
Surf and Stay with Soul Surf School, Tripadvisor's number one activity provider in Byron Bay. Let us introduce you to surfing on some of Australia's most stunning beaches. Our professional surf coaches all with a minimum 8 years experience in the local area will take you to the best waves on the day, teaching you the foundations of good surfing in a fun and safe environment. After the session relax in our Byron Bay beachside surf hostel and take advantage of everything that the stunning town of Byron has to offer. Everything from stunning beaches, amazing scenery and wildlife, live music, award winning restaurants and of course the famous Australian weather await you. If you have never surfed before, or you are looking for a refresher course, the 5 day Deluxe Surfer Package is the perfect trip to progress your surfing very quickly. Enjoy four sessions in a group environment and then choose your instructor who you wish to take you on your last session in a private setting. This will allow us to really fine tune your surfing skills that you have learnt through the week. By the time we hit the water for the private session at the end of the week our aim is to have your surfing at a stage where you are comfortable catching your own waves, even unbroken waves if the conditions allow. One of the main focuses on the last lesson will be control and change of direction and linking turns. This is all achievable after a week on the 5 Day Deluxe Surfer package.